After a several month delay, the University of Alaska will launch a survey March 2 that deals with sexual assault on campus. The Campus Climate Survey will go to 15,000 randomly selected students, faculty and staff members. It starts with questions about sexual assault awareness training and asks how well the university deals with reports of sexual misconduct. University attorney Michael O’Brien says results of the survey will remain completely anonymous and won’t be published. “This is a way for the university to get a sense of how big a problem sexual assault and sexual harassment are on our campuses, how good a job are we doing at getting out the message about sexual assault and sexual harassment prevention and whether our training is getting out to our community,” O’Brien says. It’s been the university’s goal to offer training on sexual assault to everyone in the school community. Incoming freshmen learned about rules surrounding sexual misconduct and where to go for help during orientation last August, staff and faculty were trained before the school year started, and Residential Life has been offering sessions. O’Brien says those are just a few examples. He says the Board of Regents was trained for the first time during its meeting last week in Anchorage. “We cannot guess who’s going to receive a report of sexual harassment or sexual assault. It could be you, it could be me, it could be a member of our custodial crew and it could be a Regent and we want them to know as well what they can do if something like that happened,” O’Brien says. Last May, the U.S. Department of Education put the University of Alaska system on a list of about 60 colleges nationwide being investigated as part of a compliance review or for mishandling sexual assault complaints. That list is now at more than 90. Federal auditors from the Office of Civil Rights visited campuses in Anchorage, Fairbanks, Juneau and Bethel last October as part of a compliance review, which remains ongoing. O’Brien says the auditors are still going through the more than 10,000 pages of documents the university submitted last year and need to do more interviews. 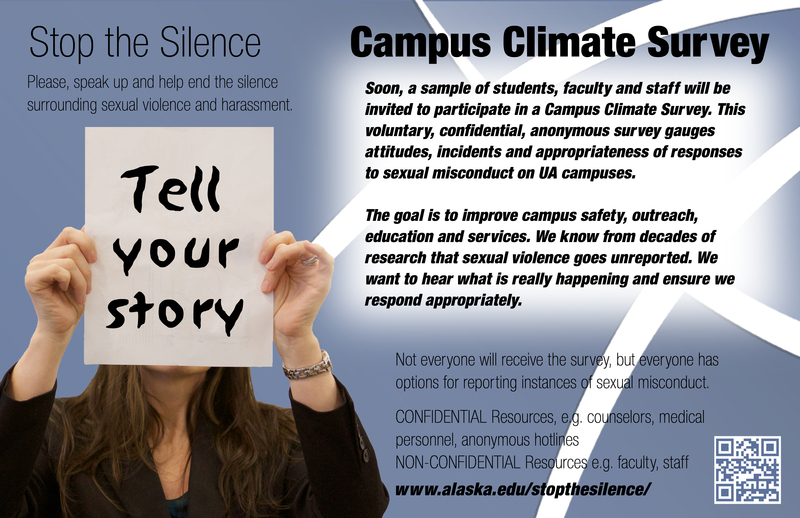 This is the first time University of Alaska will conduct a campus climate survey. Back in April, the White House had recommended that all colleges do them and provided sample questions. Initially, the University of Alaska modeled its survey after the federal government’s, but O’Brien says there were some problems. “Harassment online wasn’t addressed in the survey and because we have such a large online e-learning community, we did not want to do a disservice to those parts of our population. The university planned on doing the survey at the end of last year, but didn’t want it to come out at the same time as finals,” he says. At that point, the university had received more than 20 complaints of sexual harassment and about a dozen reports of sexual assault since the beginning of the school year.